I went to an estate sale yesterday and in the basement gasped when I confronted this steel sink base — unlike any I’ve seen before. 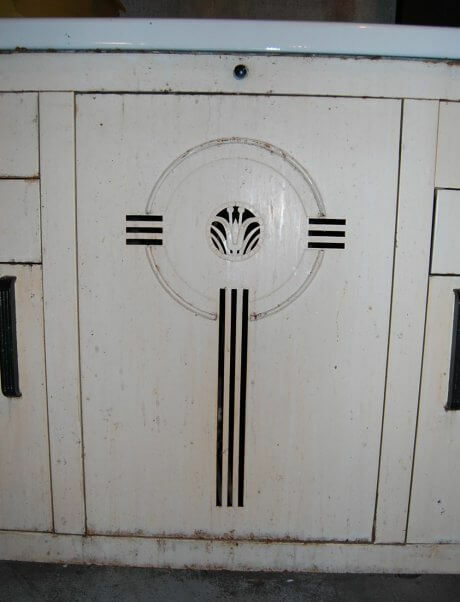 The deco-style design in the cabinet door is actually cut right into the outer layer of steel. I’ve identified 70 brands of steel kitchen cabinets from about 1935 onward. I wonder if this is a 71st? How exciting! 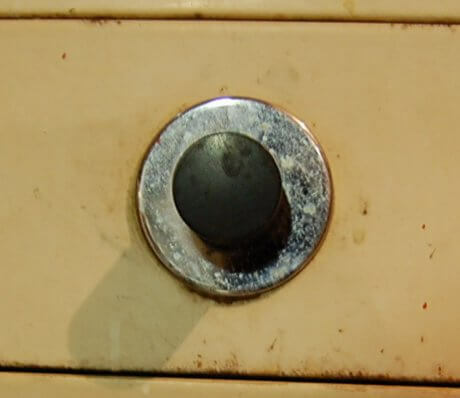 This is the only marking that I could find on the cabinet — Dupont Delux finish…inside the base cabinet door. So – that is the deco flower design looking from the inside out. Here’s the inside — notice the bare steel rods. I am not sure what the story is with these. Like, were you supposed to put a board there? I have to admit, I think I was protein starved by this point, so my head was a little spinning. You can set the inside of the deco door, too…The steel is die-cut on the outer layer, and the inside layer to cut and molded around the die cuts in order to have the light shine through. This must have been tedious work…. 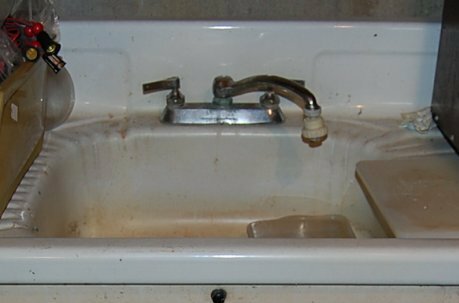 The sink top itself was also really cool – notice how the bowl is rounded and the sink top is molded in a round fashion, as well. I also quite like that high backsplash. Base and wall cabinets identified! 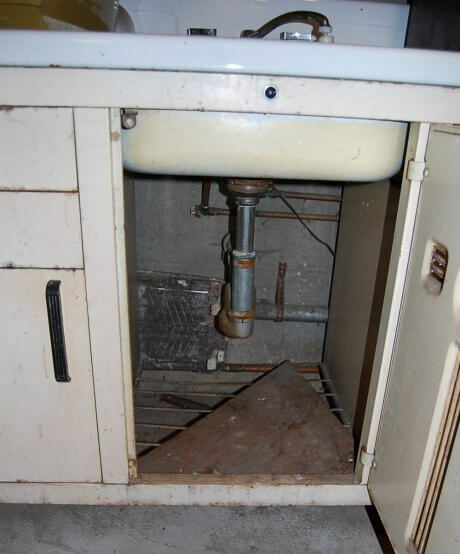 Update: On April 4, 2014, reader Lady Draco spotted a craigslist ad from Pleasant Valley, Maryland, that include wall and base cabinets in addition to the sink cabinet. What a great find! Thanks to owner Wendi for permission to archive these photos here. She says the kitchen is in disarray in the photos because the house is getting ready for sale. 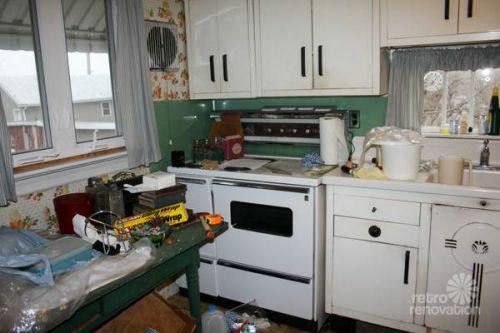 She said that she and her mother, who owns the house, decided to sell the cabinets before listing the house — out of fear that a new owner would not recognize the cabinets’ value and simply trash them. Wendi told me that there was already a buyer lined up — and that she was going to put them in an old house she was restoring. Woot! 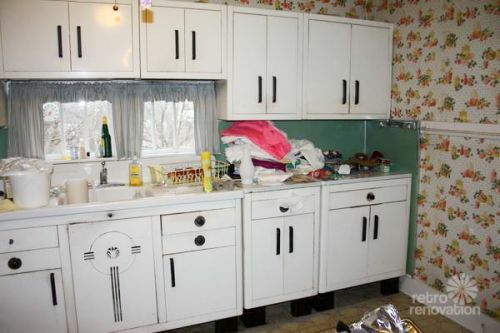 These are rare cabinets, indeed, I think. Thanks to Lady Draco and to Wendi and her mom, and to the new buyer, for recognizing the value of preserving these beauties. 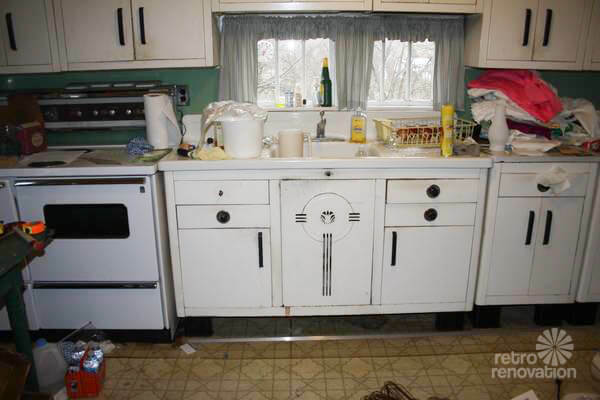 See our 100+ stories about vintage steel kitchen cabinets here. 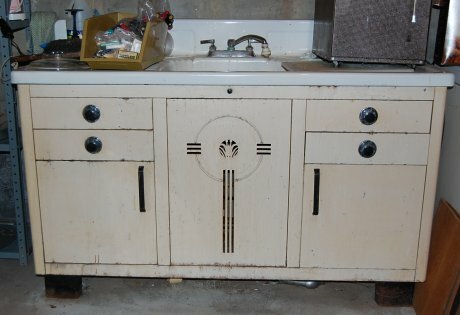 My Great Grandparents had a sink base similar to this BUT theirs had double doors under the sink with a die cut swan in each door facing each other………It was in the house when they moved into it in 1933 but was never used by them as they set up a kitchen in the basement of the house. I lived in a WWII era apartment complex for about 5 years that had wonderful metal cabinets like this. Someone purchased the entire complex, kicked everyone out, and REMODELED to a perfectly bland and boring HUD approved monstrosity. I cried when I toured MY apartment (the first one finished) after the remodel. So some very wise person ventilated the “wet” cabinet! Very cool & smart. Those are amazing, ty for sharing. I’ve just acquired the same beautiful sink and base cabinet. Trying to find manufacturer or definitive age. 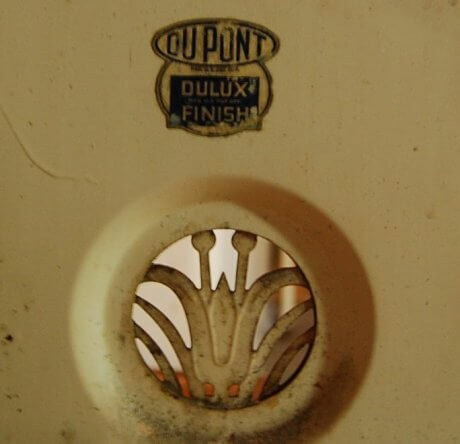 There’s a label “Dupont Delux” which refers to the finish. Was anybody able to establish the age or maker? What would an estimated value be? I’m stumped. Jodi, I am not an expert on this subject.